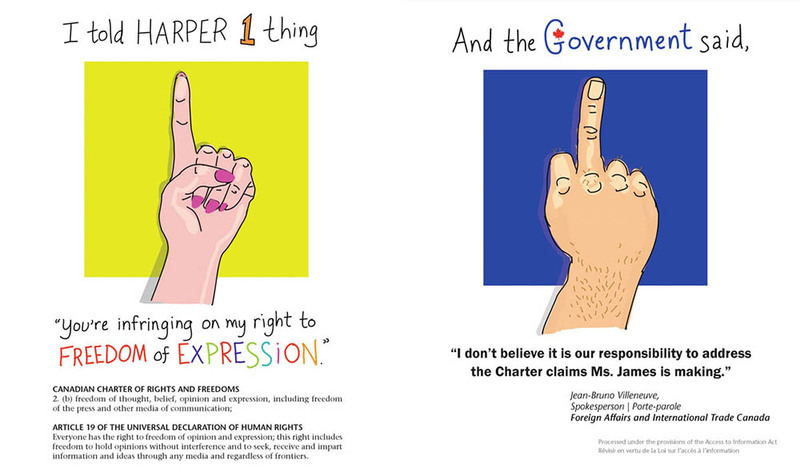 The Harper Government didn’t know what doors they opened for me by stomping on my right to free expression, and censoring my art in 2011. Hey, who the hell is going to take that away? It’s my right as a Canadian, isn’t it? But being told not to talk about climate change was more than an offensive slap in the face. It just didn’t seem democratic or fair. Ironically the government’s heavy-handed efforts at message-control has backfired — it fuelled my poster campaigns on transit shelters that eventually spanned three major cities in Canada, and even travelled to Washington, DC. 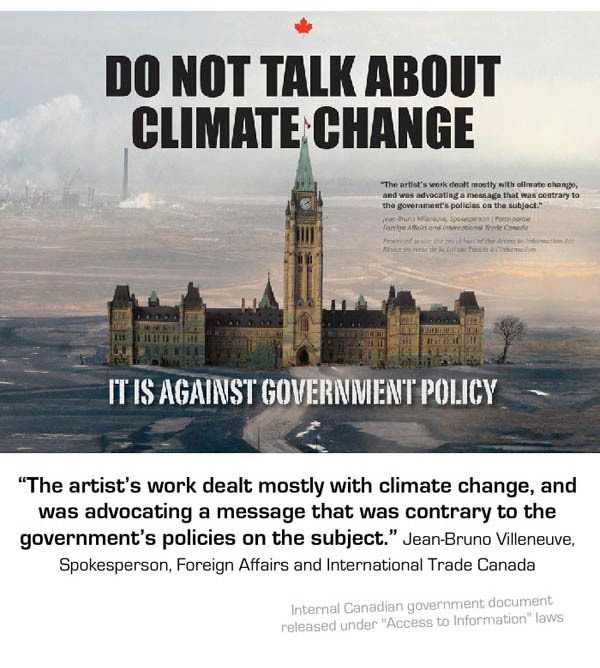 In May 2013, the Guardian UK wrote, “Artist finds inspiration in Canadian government’s attempt to silence her”. Many more news articles in North America and Europe followed, plus awards for my book Banned on the Hill, invitations to speak about free expression… And new opportunities I could never imagine — like this one, to create an illustration for Freedom to Read Week. Freedom to Read Week is happening February 22-28, 2015 — in bars, in restaurants, in libraries, in public spaces across Canada people are raising their voices to protect this vital right. Indoors and outdoors, you’ll hear artists and authors, poets and politicians, and people from all walks of life speak up about the need to protect our intellectual freedom — a right which is guaranteed to us under the Charter of Rights and Freedoms. Anyone can host an event. Freedom to Read Week is organized by the Freedom of Expression Committee of the Book and Periodical Council. “I love my freedom to read whatever I want.” That joyous phrase has been doing its sassy dance in my head since I first saw Franke James’s vibrant illustration for Freedom to Read Week 2015. And I can’t think of a better way to celebrate your freedom to read than to dive into the bounty of articles served up in this year’s Freedom to Read review. Our writers have tackled some of today’s most challenging free expression issues. You can read about our featured champion of free expression, media lawyer Brian Rogers, the staggering failure of our access-to-information system, secret trade deals, controversy over library collections, imprisoned journalists, book challenges and much more. You will also learn about an issue that is playing an increasingly significant role in Canadians’ lives: electronic surveillance. Read Bill Kowalski’s sobering account of the extent to which our online activities are being watched. Enjoy Mark Leiren-Young’s mischievous take on the impact of surveillance on writers. Find out what Hilary McLaughlin learned in her review of Julia Angwin’s book Dragnet Nation: A Quest for Privacy, Security, and Freedom in a World of Relentless Surveillance. And check out talented high school student Leslie Riahñezas’s helpful guide to protecting your online privacy in the “Get Involved” section. In addition, journalist Mark Bourrie takes a hard look at the obstacles confronting anyone who attempts to gain access to government information. Groundwood publisher Sheila Barry shares her philosophy and passion for children’s books. And science librarian John Dupuis takes us behind the scenes in Canada’s federal library system. After you’ve feasted on these stories, we challenge you to take the quiz in the “Get Involved” section to find out how you rate as a free expression expert. Whatever your score, we’ve got lots of resources so you can learn more, get involved and thoroughly celebrate your freedom to read! 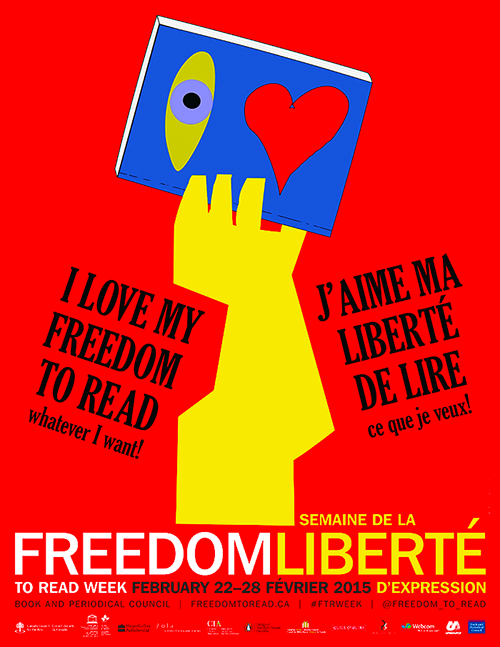 Check out the Freedom to Read gallery to see all of the posters created over 30 plus years. Download clipart and web banners to help spread the word! You can also purchase the poster in the Freedom to Read 2015 Kit from the Book and Periodical Council. Q: Can you tell us a little bit about Freedom to Read Week and why it was created?